I love noodles. And I love soup. I love going to Happy Sushi and getting a big steamy bowl of Tempura Udon. I crave it. I want it all the time. Even in the summer when it's hot, I could eat that big bowl of Udon Noodles and enjoy every bite. I dated a boy in college who had served a LDS mission to Japan and he loved to take me out for lunch to his favorite little Japanese joint. We went at least once a week and sometimes twice. Thanks to Jason, my grocery budget that first year at BYU was quite small. The restaurant was tiny, but super tasty, and this is where I first learned to love Curry and Katsu. They had noodles too. The food there was better than my all time favorite, The Utah Noodle. So imagine my delight when I married Mr. Tall, Dark and Handsome and he had mission roots in the Orient as well. My Jimmy served a LDS mission to Taiwan, and we've had asian cuisine as a staple at our home for years now! Noodles are big time in Taiwan, and I'm waiting for the day that Jimmy will take me to Taiwan and treat me to all the food he talks about even 20 years later. I was going to make a big noodle soup the other night, and I'd bought some dry Udon noodles from the Asian Market. I was really hoping that they'd turn into the big, fat, chewy noodles that I love so much at the restaurants. They didn't. The dried noodles are weak in comparison to their chewy, fat, cousins. 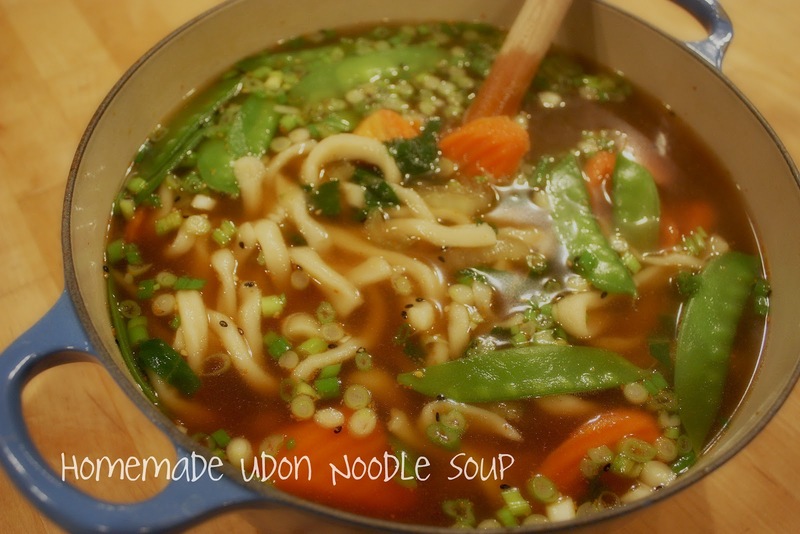 I did a little search for some Udon Soup recipes, and came upon one for homemade noodles. I didn't even think I could make them. I thought I would have to do the whole Kung Fu Panda thingy, and learn to flip and stretch my noodles. Come to find out, making homemade Udon noodles just isn't that hard. Time is your key ingredient, and if you have a little of that, you are set. We ate the whole pot in one sitting. There was a ton of slurping going on, and a lot of, "mom this is sooooo good!" I doctored up the pot of soup with some bok choy, snow peas, carrots, and green onions. You can leave it just noodles and broth if you want to. Either will make you happy. So if you're addicted to those big, fat, chewy noodles like me, you've got to give these a try. I can have my Udon fix now when ever I have the time, and I don't even have to travel to town. Love that! Here's a link to a great Youtube video that shows you exactly how to roll out and cut your noodles. I found it extremely useful. Give this udon noodle recipe a try yourself. You don’t have much to lose but some flour and time. This udon noodle recipe produces about 2 1/4 pounds of cooked noodles, which is ample for 8 portions. If you use a stronger (higher protein) flour such as King Arthur, you may need a touch more water. Add it by the teaspoon when moistening the dry ingredients. 1. Put the flour and salt in a food processor bowl. Pulse a few times to blend. Remove the feed tube and run the machine while you pour the water in a slow, steady stream. 2. Transfer the dough and all the bits to your work surface. Start kneading it vigorously. You should not need any water. Knead for about 5 minutes, slapping the dough onto the work surface occasionally to work the gluten. You’re done when the dough is smooth and feels firm-soft, nearly as soft as your earlobe but not quite. Shape the dough into a ball and slide it into a zip-top plastic bag. Seal well, pressing out all the air. Set aside to rest for at least 2 hours or up to 4 hours in summer and 8 hours in winter. 3. Before you roll out the dough, set a big pot of water on the stove and heat it up. You’ll be making the noodles and cooking them at the same time. 4. Remove the dough from the bag and put it on lightly floured work surface. Roll the dough out to a thickness of 1/8 inch, turning it and flouring it occasionally to prevent sticking. Aim for a rectangle-like shape. 5. Then fold it in half, dust the underside, then fold back 1/4 of the dough on each side to create flaps. Watch the video for guidance. 6. Use a knife to cut strips of noodles, each a scant 1/4 inch wide. Cut about a quarter of the dough then pause to unfold the strips into noodles. Use your fingers to pull on the noodles to stretch them out to about twice their width. Cut the longer strands in half to yield noodles about 12 to 16 inches long. Gently dust the noodles with flour. Drop the noodles into the boiling water. Let them cook for about 3 minutes (the water may not return to a boil), until the float to the top and are chewy tender. Then use a slotted spoon to remove the noodles from the hot pot. Deposit them into a bowl of cold water to cool for a few minutes. Drain into a strainer and set aside to cool. Replace the water in the bowl to cool the next batch of noodles. While the noodles cook, cut more noodles from the dough, pausing again to unfold and stretch the strips. If you work on a quarter of the dough at a time and cook them, you’ll get into a rhythm. Or, get someone to help you. 7. The noodles are ready to use or eat. You can store them cooked for several days. Return them to room temperature before using. You can refresh them with a dunk in a pot of boiling water. Bring the chicken broth, soy sauce and all the veggies to a boil. Boil until the carrots are tender. 5-10 minutes. Now add the cooked noodles. Serve! I thought I would check out your blog after I read about it in the Herald Journal; you also came to our R.S. night a few months ago (Prov. 5th Ward). These noodles look great! I'm excited to try them. I had to comment on your story and how your husband went on a mission to Taiwan. I'm Taiwanese (my parents were born there but I was born in the U.S.), and my son just got called on a mission to Taiwan, Taichung! 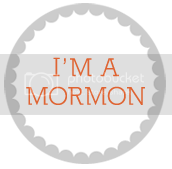 He leaves July 10. We are super excited. You'll have to get James to take you to Taiwan. My parents took the whole family to Taiwan a couple of summers ago. We loved it!